Director – Dwight H. Little, Screenplay – Duke Sandefur, Based on a Screenplay by Gerry O’Hara, Based on the Novel by Gaston Leroux, Producer – Harry Alan Towers, Photography – Elemer Ragalyi, Music – Misha Segal, Makeup Effects – Kevin Yagher, Additional Prosthetic Effects – Magical Media Industries Inc (Supervisor – John Buechler), Art Direction – Tivadar Bertalan. Production Company – 21st Century Film Corporation/Breton Film Productions. Music student Christine Day obtains a piece of music entitled ‘Don Juan Triumphant’, which is the lost work of 19th Century British composer Erik Destler. As she sings the piece at an audition, she is struck by a dropped sandbag. She regains consciousness to find herself back in 19th Century London where she is the understudy in ‘Faust’. The opera house is haunted by rumours of a phantom. The phantom is in fact Destler who has sold his soul to The Devil so that his music could be immortal, the price of this being that his face would be scarred and hideous to all, forcing him to hide it behind a mask of sewn flesh. 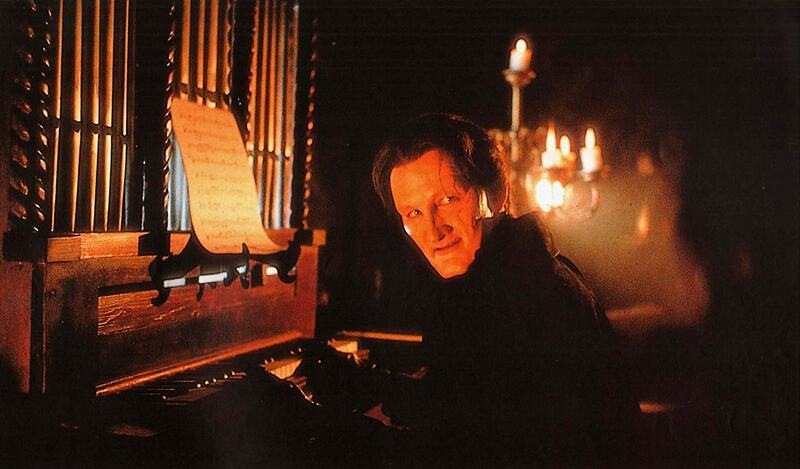 Destler gives secret tuition to Christine and kills those in the way so that she can become the lead in ‘Faust’. After the triumphant premiere, Destler abducts her down to his lair, insisting that she be his forever. This is the fifth film version of The Phantom of the Opera and is certainly the most outlandish. It was produced at the height of the madness surrounding the Andrew Lloyd Webber stage musical and has been clearly intended to exploit the popularity of this. It was also made as a vehicle for Robert Englund, who had become a cult figure as Freddy Krueger in A Nightmare on Elm Street (1984) and sequels. The result is a clear attempt to straddle both influences, schizophrenically resulting in a Phantom who is a misunderstood genius composer and a lost romantic but also has a pizza face and is a maniacally bloodthirsty slasher. Understandably, Robert Englund makes for the most evil of the usually sympathetic screen Phantoms so far. Most bar the Freddy Krueger cult hated The Phantom of the Opera. On the whole though, it is not as bad as it might be. The slasher element is not as incongruous with the story of The Phantom as might initially seem – usually this version is disparaged by those who have come to regard The Phantom of the Opera as a romantic story following the Lloyd Webber musical when, in fact, the original story was intended as a thriller/horror story. Certainly, the story of The Phantom is strong enough to raise the film above the usual level of most slasher films. There are some interesting new interpolations created in this version – the location is, for no apparent reason, transferred from Paris to London, effectively represented by Budapest which, with its paved streets, convincingly 19th Century pubs and restaurants, and lavish opera house gives the film a much higher budgeted look than would have otherwise been allowed. The film is also missing, for some reason – perhaps budgetary? – the classic falling chandelier scene. Prior to The Phantom of the Opera, director Dwight H. Little had made the banal Halloween 4: The Return of Michael Myers (1988) but redeems himself here with a competent Gothic hand. There are some effective scenes with The Phantom appearing to Christine in the graveyard, serenading her with a violin and sweeping her away on a coach or, in a scene taken direct from the Lon Chaney version, his appearance at the masque dressed as Edgar Allan Poe’s Red Death. There are the inevitable slasher scenes, some of which Little fumbles. However, Little balances these out with some striking images, like The Phantom placing gold coins over the eyes of the thugs he has attacked. There is an impressive makeup effects set-piece with Robert Englund removing his wig, skin, nose and ears to reveal his scarred face beneath. The role of The Phantom gives a more substantial acting part to Robert Englund – but Englund, even when playing the wholly cartoonish character of Freddy Krueger, is a terrible actor. Jill Schoelen makes a competent Christine but no more than that. One silly aspect of the film is the modern framework, which fails to make sense. Is the contemporary Christine a reincarnation of the 19th Century one? Was it all a dream while she was unconscious? Did she mentally time-travel back or what? How come the 19th Century Christine knows the lyrics to Don Juan Triumphant that the 20th Century Christine does but nothing else? It doesn’t make sense, nor is such a framing device necessary. The only reason it serves is one of insecurity – the belief that modern audiences are not able to handle a period setting. 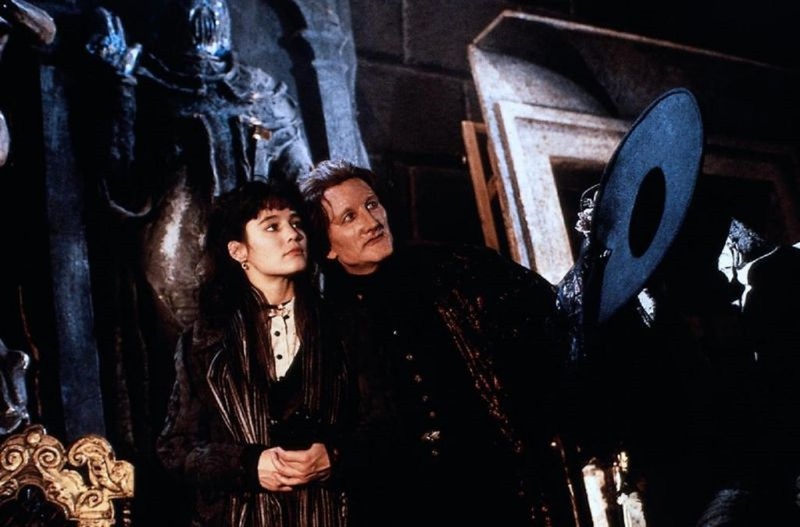 In some places Danse Macabre (1992) featuring Robert Englund as a psychopathic ballet master was billed as The Phantom of the Opera II, although is unrelated beyond starring Englund in a similar role and coming from the same producers. Dwight H. Little went onto make action films like Marked for Death (1990), Rapid Fire (1992) and Murder at 1600 (1997), even Free Willy 2: The Adventure Home (1995), but has mostly worked in television subsequently. Little returned to genre material with Anacondas: The Hunt for the Blood Orchid (2004) and the adaptation of the videogame Tekken (2010). The other versions of The Phantom of the Opera are:– The Phantom of the Opera (1925), the finest version of all starring Lon Chaney; Phantom of the Opera (1943) starring Claude Rains; The Phantom of the Opera (1962), the Hammer version starring Herbert Lom; Phantom of the Opera (1983), a tv movie starring Maximillian Schell; The Phantom of the Opera (1990), a tv mini-series starring Charles Dance; The Phantom of the Opera (1998) from Italian director Dario Argento starring Julian Sands; and The Phantom of the Opera (2004) from the Lloyd Webber musical starring Gerard Butler. Other variations on the story are The Phantom of the Paradise (1974), a satirical version that sets the story to rock music; a pornographic version Phantom (1998); Angel of Music (2008) about a modern reporter conducting an investigation into the truth of the story; Phantom of the Theatre (2016), a Chinese version that conducts some radically different takes on the story; and modernisations like The Phantom of Hollywood (tv movie, 1974), The Phantom of the Ritz (1988), Phantom of the Mall: Eric’s Revenge (1989) and a Disney Channel children’s tv movie The Phantom of the Megaplex (2000), which had the Phantom haunting respectively a movie studio, a movie theatre, a mall and a cinema multiplex, as well as the low-budget The Phantom of the Opera (2014) where the Phantom’s spirit is disturbed by a reality tv crew.